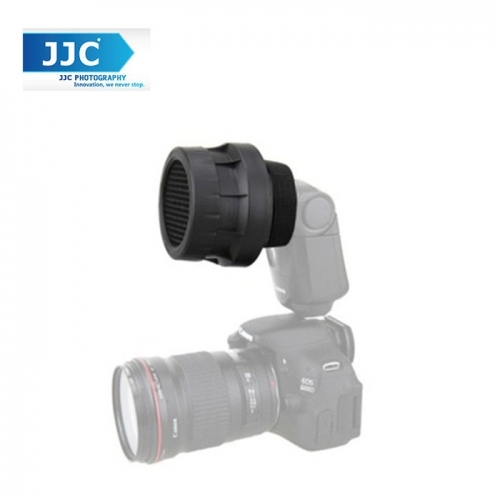 JJC 3-in-1 Stacking Grid Light Modifier System Grids are designed to be used on camera flashes. The included 3-in-1 Honeycomb Grid is a uniquely designed stacking grid system to provide 16°, 25° and 45° spot lighting control. It can be used at anytime a photographer is interested in highlighting a portion of an image for dramatic effect. Such as hair lights in portraiture, or for background or accent lights. When attached to an off-camera flash, the grids can help draw attention to an object, thus creating a desired atmosphere or mood in an image. When attached to a light source, a honeycomb grid creates a spot of light for adding dimension and depth to an image, or for highlighting important features. The angle of the grid determines the size of the spot projected forward, with smaller degree grids producing smaller spots, and larger angles producing larger spots. Designed for those flash head's wide is approximately 49mm, and the length is below76mm. For medium size spots of light just stack the larger size grid into the bezel.